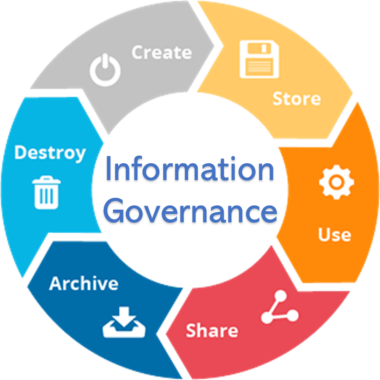 Information governance is the management of information at an organization. Information governance balances the use and security of information. 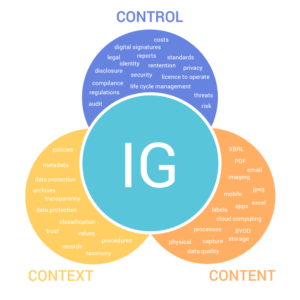 Information governance helps with legal compliance, operational transparency, and reducing expenditures associated with legal discovery. Why do we need Information Governance services? Every organization needs to find and manage content for data cleanup, business value archiving, internal investigations, regulatory investigations, and litigation. Responding quickly and in a cost-effective manner is largely impacted by how efficiently an organization is managing its information. Where is that information located? What is the value of that information? Do I have enforceable and defensible retention policies (and the right policies) in place? Safer and more secure data. Increased productivity facilitated by intelligent sharing of information. Reduced costs due to optimized storage. Every organisation, no matter what size, is faced with the challenge of an ever growing mountain of information in its enterprise systems and beyond. The additional challenges of having to comply with governmental, financial and industry regulations, as well as respond to an increasing number of litigation events are driving organisations to embrace Information Governance. - The time and cost that is incurred in identifying, retrieving, reviewing and then having to reject all of the information that is of absolutely no value in the issue at hand is huge. - Organisations are under an ever increasing amount of scrutiny. Today, there are countless government regulations, industry standards and company procedures that have to be met. - The exponential growth and availability of structured and unstructured data has increased the risk and cost of maintenance of such huge information. - The reducing storage cost tempts organizations to retain all the information within their business which in turn attracts huge cost of managing that stored information across its life cycle. - Information security and privacy issues are closely related to the regulatory compliance challenge that organizations face. Many governmental regulations have requirements for handling and retention of certain types of information under the organization’s control. 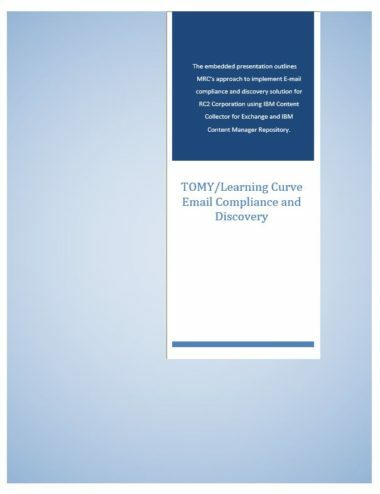 MRC Information Technology has successfully implemented an Email compliance and e-Discovery solution for our client TOMY/RC2 Corporation. We used IBM Content Collector for Exchange product to archive e-mail and attachments into an IBM Content Manager repository. Get in touch with us to learn more about our Information Governance Services offering and find out which one best suits your needs!